Blossom Keepsake - My Milky Forever Keepsake*. 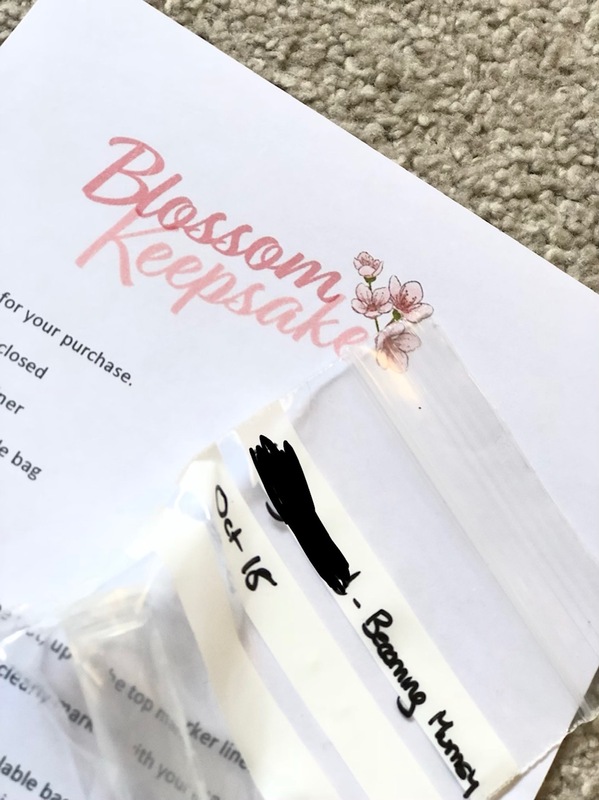 If you've been following my Instagram stories, you'll have seen that I posted about sending off some of my milk to Blossom Keepsake, to be made into something beautiful! I've been asked whether this type of jewellery is similar to my teething necklace that I have, and I thought I'd clarify that it isn't. These are handmade pieces of jewellery that can be made using breast milk, ashes, hair and placenta. So they are very personal and sentimental pieces of jewellery! After deciding to breastfeed, I knew that I'd love a keepsake to remember this time in my life. It's all well and good being able to say 'I breastfed my baby', but I wanted something physical to keep, that I could remember this experience, and keeping a bit of milk in the freezer wasn't exactly what I'd had in mind. Then I came across Blossom Keepsake. After coming across Hayley, I knew that I would need a piece of jewellery to be that keepsake. Hayley and I exchanged various messages, which made the whole process feel very relaxed and professional at the same time. Sending someone something that belongs to you can be quite daunting, especially when it's something so personal. So, finding someone that is friendly and caring is exactly the sort of person you need, and Hayley is exactly that. Once we had discussed everything, my milk container kit arrived. I was quite shocked at how small the amount of breast milk that I had to send was! I'm not really sure what I expected, but I was pleased that I wouldn't have to express too much, since I don't particularly get on with pumping. The kit contained a small vial that would hold 5ml of breastmilk. So I got to expressing the amount that I would need and then posted it as soon as I could, as I was so excited! Hayley kept me up to date throughout the process, and even sent me a time lapse video of my milk being formed into the stone - amazing! 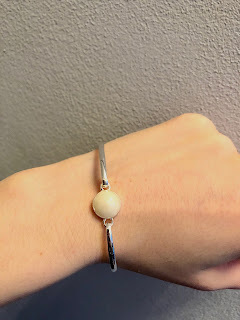 As soon as it arrived, I couldn't wait to get in the box and have a look at my new bangle. I wasn't exactly sure what I was expecting, because 1. I'd never had anything like this before, and 2. my bracelet is currently, one of a kind, in that they are not currently available to purchase. 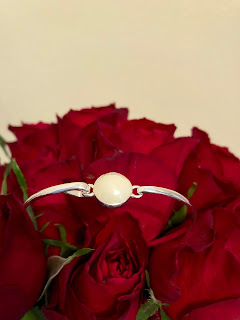 I guess, my bracelet will always be one of a kind though, as the stone is made from my milk. This type of jewellery is very personal and I understand that it's not everyone's cup of tea, but there's something wonderful about being able to keep something like this. It's something that I'll be able to share with Edith, once she is older, and hopefully she'll appreciate how sentimental it is to me. Upon looking at it, I really don't think you would be able to tell that the stone is made from breast milk and I think that's what makes me love it even more. I like to wear minimalist jewellery, so this is very me. However, if you would want to add a little extra to your jewellery, colours and glitters can be added to the stone making process, which I think is great! I opted to keep mine plain. So, if you're considering treating yourself, or asking someone to treat you, to this kind of jewellery, then I cannot stress enough that you absolutely should. You can find Blossom Keepsake over on their Facebook page by clicking here. Have you ever thought about a keepsake like this? *This post was made in collaboration with Blossom Keepsake, however, the views as always remain 100% my own.